NPC19 Attendees: Be sure to visit the CPAT satellite exhibit, sponsored by WRT, at APA's 2019 National Planning Conference. We're located on Level 2 in the Moscone West Convention Center. By pairing a multidisciplinary team of expert planning professionals from around the country with community members, key stakeholders, and relevant decision makers, the place-based initiative seeks to foster community education, engagement, and empowerment. 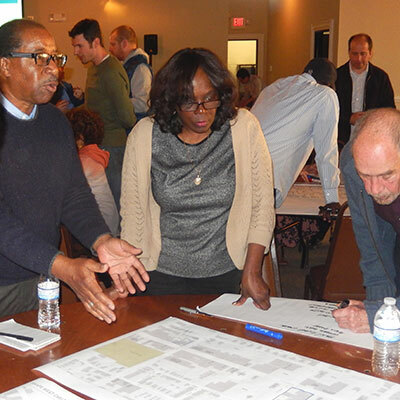 Each team member is selected for the specific expertise needed on the project to offer pro bono assistance in developing a framework or vision plan that promotes a sustainable, livable, economically vibrant, and healthy community. Communities facing a range of challenges including, but not limited to, social equity and affordability, economic development, sustainability, consensus building, and urban design are well-suited for assistance through the program. Projects focus primarily on localities with a demonstrated need for assistance, where planning resources and expertise may not otherwise be available. CPAT projects are collaborative efforts with shared responsibilities. CPATs and communities work together throughout the process. APA contributes the time of its staff and volunteer experts while the recipient communities cover travel costs. Community proposals or inquiries about potential projects are accepted anytime. Contact us to talk about your project. Contact customer service or call Ryan Scherzinger, Programs Manager, at 312-786-6359. CPAT is an opportunity for communities that need assistance. Let them know about it. E-mail SpreadTheWord@planning.org to receive an auto-response with an outreach template you can personalize and send to them. APA Wants to Help Your Community! How do I know if my project is ready for a CPAT? CPATs offer a tremendous amount of work and expertise, but projects must be focused enough to accomplish the objectives. The timing must also be right. Is the community ready to address the issues or goals of the project? How will a CPAT build on any previous efforts? What do you intend to change as a result of a CPAT project? Attention Planners! Want to Give Back? Experienced planner or professional in an allied field? Want to help a community by joining a team? Let us know you're interested by filling out the online volunteer form. APA encourages Chapters and Divisions to create their own pro bono, direct service community assistance programs. Several Chapters have established programs and others have begun the process of starting their own. The CPAT program was relaunched in 2011 and has grown significantly since that time. The practice of providing pro bono technical assistance to communities is not new to APA, however, with volunteer teams dating back to 1995.